Visiting a new church can be intimidating. We understand the many thoughts that can come from visiting a new church, so we want you to feel completely comfortable when you visit. Below are some frequently asked questions. If you have any additional questions, don't hesitate to contact us. How do I get to LCC? Services are on Sunday mornings at 10:30 a.m and on Wednesday nights at 7:00 p.m. Life Christian Center offers an intimate and informal setting that encourages all to worship God through individual expression. If you arrive late, just help yourself to a seat. If you need to leave early, no-one will complain if you slip out. You may sit anywhere, no seats are reserved. We encourage people to bring a Bible if they have one. If not, Bibles are provided for your convenience. You are not expected to contribute to the work of the church (that's our responsibility) so don't feel embarrassed to pass the collection plate without putting anything in it. Many church members contribute once a month, so you won't be the only one just passing the plate on. We want you to feel comfortable. After all, we are thrilled that you're joining us and want you to be more focused on the service than what you're wearing. In the summertime, it's not uncommon to see people wearing sandals, shorts, and a shirt. Others prefer to still put on their "Sunday best," and that's fine too! We think you'll fit in no matter how you dress. How do I get to Life Christian Center? 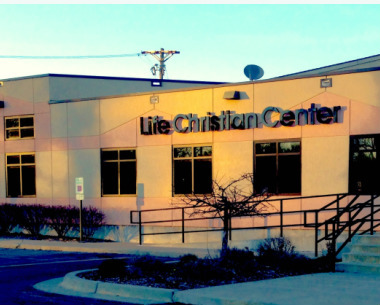 Life Christian Center is located at 1650 E. Langsford Road in Lee's Summit, MO. Children's Church is the perfect place for your children infant through sixth grade to go while you attend service. Nursery facilities are available for parents of infants. If you would like your children to go to Children's Church, visit the Children's Welcome Center located down the staircase on the lower level of the building. Your children will be checked in, and you will receive a receipt sticker which you will need in order to pick up your child. For the safety and security of your child, it is important that you keep track of your receipt sticker. This helps us know that you are the person authorized to pick up your child.